by Sharon Cohen, The Associated Press. Saturday, June 4, 2011. | various sources. CHICAGO — It was a monumental project with modest beginnings: a small group of scholars and some index cards. The plan was to explore a long-dead language that would reveal an ancient world of chariots and concubines, royal decrees and diaries — and omens that came from the heavens and sheep livers. The year: 1921. The place: The University of Chicago. The project: Assembling an Assyrian dictionary based on words recorded on clay or stone tablets unearthed from ruins in Iraq, Iran, Syria and Turkey, written in a language that hadn't been uttered for more than 2,000 years. The scholars knew the project would take a long time. No one quite expected how very long. Decades passed. The team grew. Scholars arrived from Vienna, Paris, Copenhagen, Jerusalem, Berlin, Helsinki, Baghdad and London, joining others from the U.S. and Canada. One generation gave way to the next, one century faded into the next. Some signed on early in their careers; they were still toiling away at retirement. The work was slow, sometimes frustrating and decidedly low-tech: Typewriters. Mimeograph machines. And index cards. Eventually, nearly 2 million of them. And now, 90 years later, a finale. The Chicago Assyrian Dictionary is now officially complete — 21 volumes of Akkadian, a Semitic language (with several dialects, including Assyrian) that endured for 2,500 years. The project is more encyclopedia than glossary, offering a window into the ancient society of Mesopotamia, now modern-day Iraq, through every conceivable form of writing: love letters, recipes, tax records, medical prescriptions, astronomical observations, religious texts, contracts, epics, poems and more. 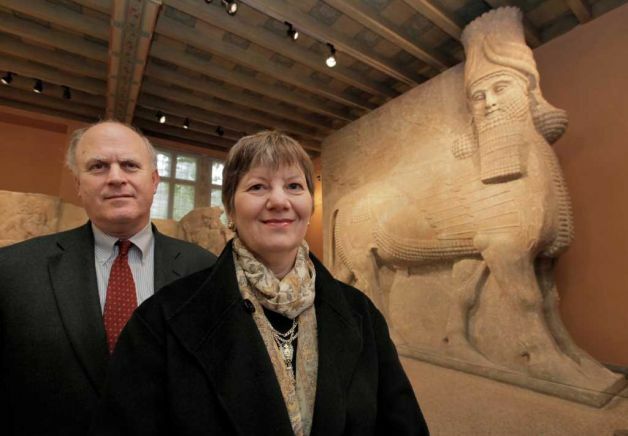 In this May 27, 2011 photo, Martha Roth, dean of humanities at the University of Chicago, and Gil Stein, director of the Oriental Institute at the university, examine reliefs from the palace of Sargon II (721-705 BC in the Assyrian capital city of Khorsabad, in northern Iraq) in one of the institute's galleries in Chicago. Roth is the editor-in-charge of a project started 90 years ago by the institute to assemble an Assyrian dictionary based on words recorded on tablets unearthed in Iraq, Iran, Syria, and Turkey, and written in a language that hadn't been uttered for more than 2,000 years. The massive 21-volume collection is now complete. 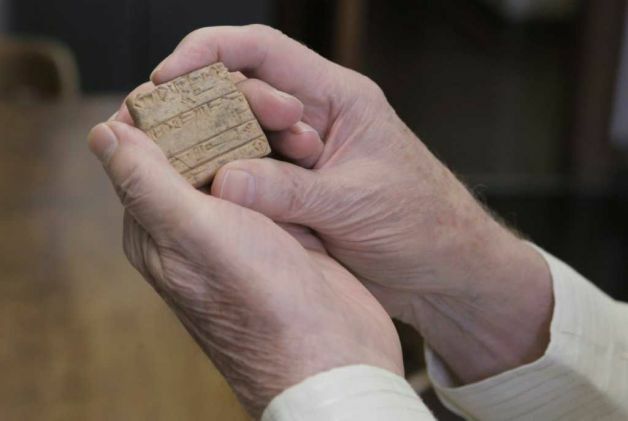 "The Assyrian Dictionary gives us the key into the world's first urban civilization," he says. "Virtually everything that we take for granted ... has its origins in Mesopotamia, whether it's the origins of cities, of state societies, the invention of the wheel, the way we measure time, and most important the invention of writing. " If we ever want to understand our roots," Stein adds, "we have to understand this first great civilization." The translated cuneiform texts — originally written with wedged-shaped characters — reveal a culture where people expressed joy, anxiety and disappointment about the same events they do today: a child's birth, bad harvests, money troubles, boastful leaders. "A lot of what you see is absolutely recognizable — people expressing fear and anger, expressing love, asking for love," says Matthew Stolper, a University of Chicago professor who worked on the project on and off over three decades. "There are inscriptions from kings that tell you how great they are, and inscriptions from others who tell you those guys weren't so great. ... There's also lot of ancient versions of ‘your check is in the mail.' And there's a common phrase in old Babylonian letters that literally means ‘don't worry about a thing.'" There were omens, too — ways of divining the future by reading smoke patterns, the stars, the moon and sheep livers. "Like all people at all times, they wanted to try to find some way of controlling their world," says Martha Roth, the dictionary's editor-in-charge and dean of humanities. "It's very difficult to draw the line between actually believing and being superstitious." Robert Biggs, professor emeritus at the university, devoted nearly a half century to the dictionary, sometimes uncovering tablets on digs in the Iraq desert, sometimes poring over texts in museums in London and Baghdad. His specialty is Babylonian medicine. For almost an entire year, he studied thousands of references to sheep livers. For example: If a sheep's gallbladder — part of the liver — was long and pointed, it meant the defeat of the enemy king. If there was a certain kind of crease on the liver, it could mean the king was going on a journey. A lunar eclipse could mean danger for a king. But the tablets reached far beyond royalty. Biggs says they included everything from a disputed paternity case to agricultural loans to famine, where desperate people sold their children for cash. "Life was very fragile ... it was much more risky that it is now," he says. Making sense of it all was painstaking work. Some of the wedge-shaped characters changed over the thousands of years, and the tablets excavated from ancient temples, palaces and cities were frequently crumbling. Often there was no punctuation, so it was hard to know where one word ended and the other began. "You'd sit in a room with a good light and turn the tablet in various directions to see as much as possible," Biggs explains. "Quite often the tablets were broken so you might see part of a sign. And different people looking at the same thing would see something different because of the way you'd hold it." "Sometimes, it got to be very tedious," he adds. "Other times, there was a sense of exhilaration if you could solve some problem or figure out what a rare word means." There was much to research, much to record. 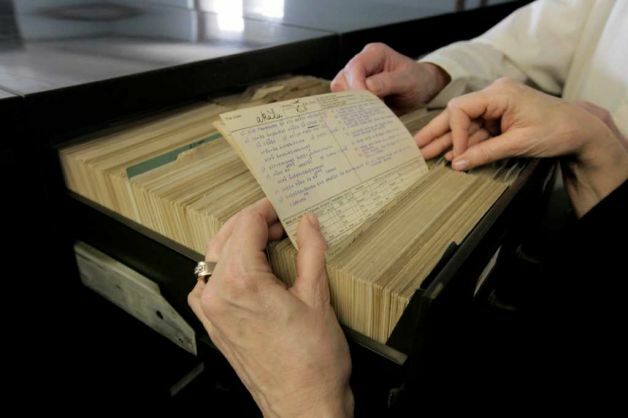 By 1935, scholars already had 1 million index cards. It would take more than 30 years before the first of the 21 volumes was published. Most cover a single letter. 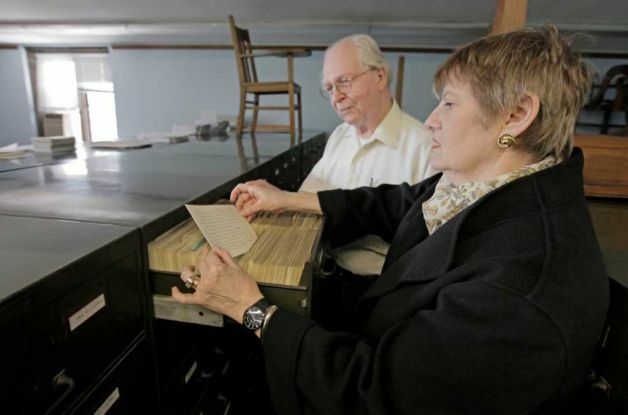 The entire collection spans about 10,000 pages and 28,000 words. 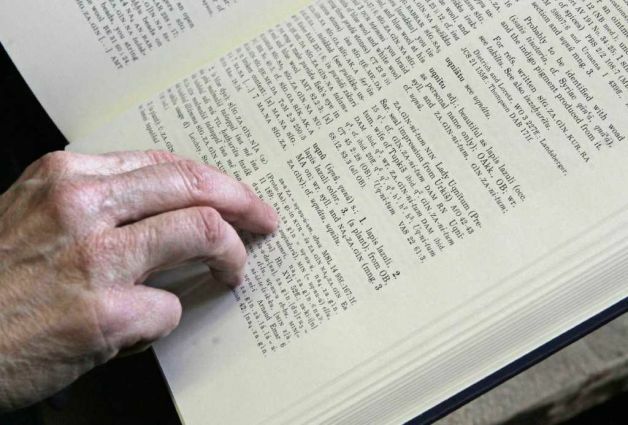 The definitions are more fitting for an encyclopedia; they provide cultural and historical context, similar to those in the Oxford English Dictionary. Now that the dictionary is finished, Roth says there's a feeling of tremendous accomplishment and "a little bit of a sense of loss.... This has occupied my waking and sleeping moments for 32 years. You dream this stuff." 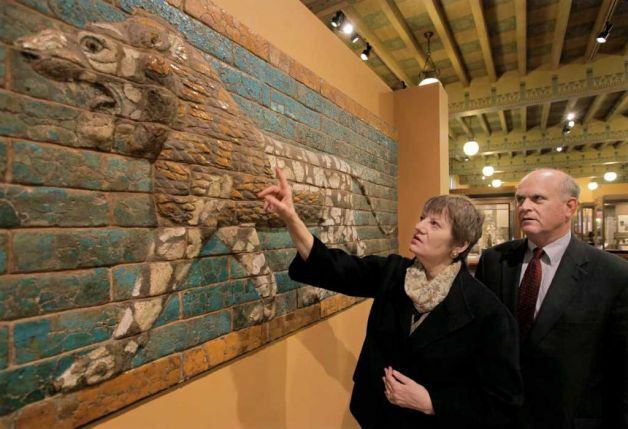 In this May 27, 2011 photo, Martha Roth, dean of humanities at the University of Chicago, and Gil Stein, director of the Oriental Institute at the university, examine one of two glazed molded brick lions from the Neo-Babylonian Period, about 604-662 B.C. in one of the institute's galleries in Chicago. Roth is the editor-in-charge of a project started 90 years ago by the institute to assemble an Assyrian dictionary based on words recorded on tablets unearthed in Iraq, Iran, Syria, and Turkey, and written in a language that hadn't been uttered for more than 2,000 years. The massive 21-volume collection is now complete. 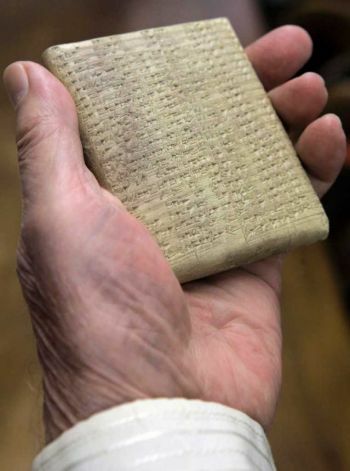 In this May 27, 2011 photo, Robert Biggs, professor emeritus at the University of Chicago, holds an Old Babylonian grammatical text stone tablet that was used in the research and assembly of the university's Assyrian Dictionary at the school's Oriental Institute in Chicago. Ninety years after research began to assemble an Assyrian dictionary, based on words recorded on tablets unearthed in Iraq, Iran, Syria, and Turkey, and written in a language that hadn't been uttered for more than 2,000 years, the massive 21-volume collection is now complete. Biggs has worked on the project for almost 50 years. 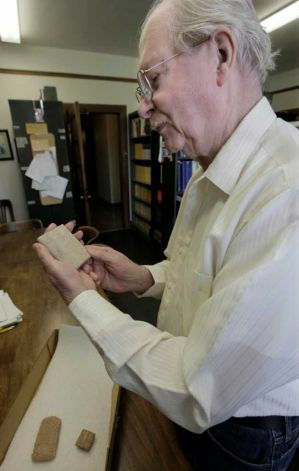 In this May 27, 2011 photo, Robert Biggs, professor emeritus at the University of Chicago, holds an Old Akkadian text tablet that was used in the research and assembly of the university's Assyrian Dictionary at the school's Oriental Institute in Chicago. Ninety years after research began to assemble an Assyrian dictionary, based on words recorded on tablets unearthed in Iraq, Iran, Syria, and Turkey, and written in a language that hadn't been uttered for more than 2,000 years, the massive 21-volume collection is now complete. Biggs has worked on the project for almost 50 years. 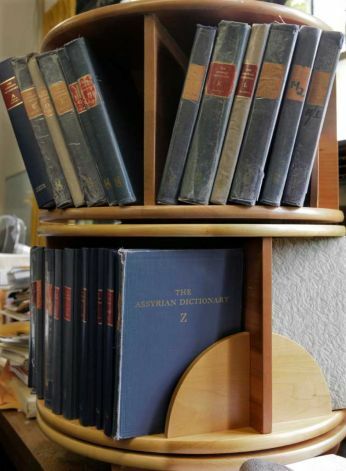 This May 27, 2011 photo shows volumes of the University of Chicago's Assyrian Dictionary on bookshelves at the school's Oriental Institute in Chicago. Ninety years after after research began to assemble the reference book, based on words recorded on tablets unearthed in Iraq, Iran, Syria, and Turkey, and written in a language that hadn't been uttered for more than 2,000 years, the massive 21-volume collection is now complete. 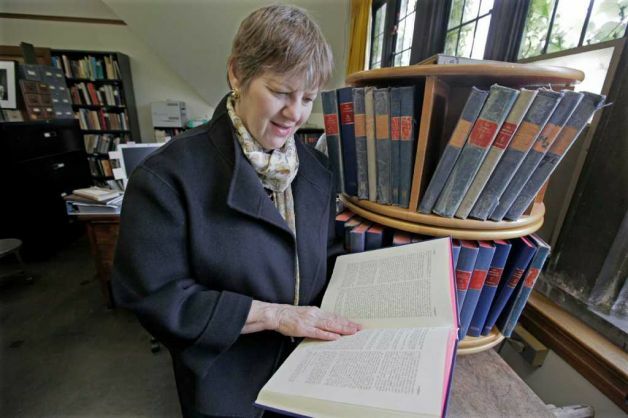 In this May 27, 2011 photo, Martha Roth, dean of humanities at the University of Chicago, browses through the final volume of the the university's Assyrian Dictionary at the school's Oriental Institute in Chicago. Ninety years after research began to assemble an Assyrian dictionary, based on words recorded on tablets unearthed in Iraq, Iran, Syria, and Turkey, and written in a language that hadn't been uttered for more than 2,000 years, the massive 21-volume collection is now complete. Roth is the editor-in-charge of the project.